HandlePod sits on a flat surface just like a mini tripod. Check out the images of mini tripods on line and you will see hundreds of photos of every variety available. All of them share a common characteristic: three typically short legs, some solid, some with extensions and some with flexible ball joints. The word tripod derives from Latin for three-feet. It is the most stable design, at least on flat, level surfaces. Three is the requirement for a tripod and there hasn’t been a deviation from that number—until now. 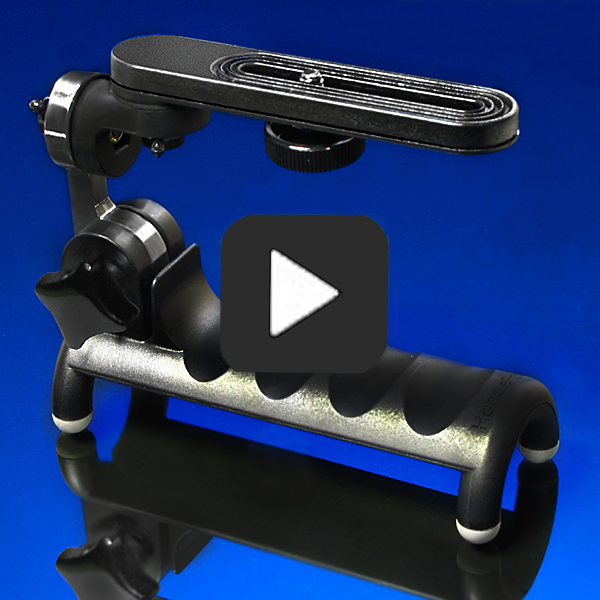 Hold HandlePod against any solid support for reliable stabilization. But why is that since hands are unavoidably shaky? Not when the hand is used to hold the HandlePod against a solid object. The rubber feet grip the support, light hand pressure keeps it in place and presto—no camera shake! But wouldn’t three feet do the same thing and be more stable? Yes, on flat surfaces three feet would provide excellent stability. But the world isn’t made of flat surfaces. There are poles and posts and rails that are round. Building corners, doorways, window frames have angled surfaces. Four feet will conveniently straddle round and angled surfaces to provide four points of contact. Three feet will not engage round or cornered objects as solidly and would be more awkward to hold in place by hand. And four feet will engage a flat surface just as easily as three. HandlePod will sit on a flat surface just like a mini-tripod—one with four feet instead of three. Four feet plus use of the hand create a versatility that goes beyond that of a mini tripod. Hold it against posts, poles, doorways, buildings and you have camera stability anywhere on anything. Look beyond the tabletop for camera support on real world objects. HandlePod makes it possible. This entry was posted in Tripod Alternative on February 24, 2015 by main user.